Whether it’s a small city balcony or a beautiful terrace in the country, this outdoor area becomes a living space in its own right in the summer. Your very own nest, it is as pleasant to eat lunch outside there in the summer, as it is to drink cocktails under the stars, or take a simple nap in the sunshine. Here are a few tips to personalise and bring a new look to your terrace. 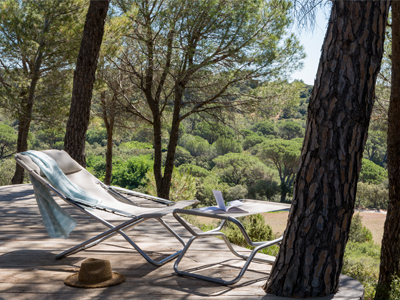 As soon as the temperature begins to rise, it is a real pleasure to relax on a lounger. To preserve the intimacy of the space, the priority is to protect it from prying eyes. A parasol serves double duty by protecting you from the sun, and also height-wise from the building opposite. To be separate from direct neighbours, you can hang a sail shade or install a screen, such as an openwork wooden panel which lets in light but which keeps everything hidden from view. 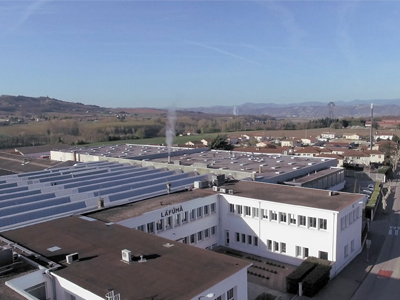 These protective measures will also stop the wind, especially for an exposed roof terrace. On a small city terrace, such as with a line of railings looking over a neighbouring building, it would be better to choose a low light reed panel or trellis to attach to the railing. To brighten up this screen, you can attach some flower pots or have some climbing plants such as clematis, which is not too invasive. As with any outdoor area, your terrace should have a stable, flat ground covering which is sufficiently robust to accommodate garden furniture. To avoid slipping, in particular when it rains, it is advisable to opt for a rough-textured covering such as tropical hardwood, composite material or duckboard. A stone slab surface, designed to last, has a tendancy to look more beautiful over time. If you don’t want to take on major building work, an outdoor designer rug made from polypropylene and designed to resist both bad weather and moisture, will brighten up a dull concrete surface very simply. Also perfect for small spaces, artificial turf can bring a touch of greenery. Once the outdoor set-up is finished, you just have to add a personal touch by arranging your garden furniture. 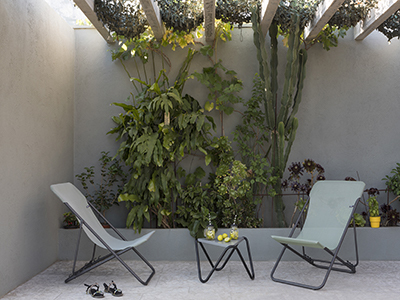 To create a leisure space, the transat or even the relax chair are essential pieces. It is even possible to outfit a narrow balcony using this compact and comfortable portable furniture. Deckchairs, as comfortable as they are elegant, have the advantage of being quick to fold, and take up little space. 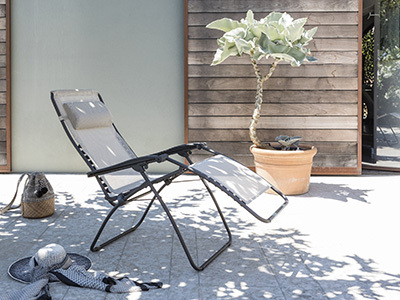 As for a sun lounger, it represents the perfect top-quality chaise longue. Combining it with a footrest lets you perfect its comfort. Equally, you can set up a loung area with pop-up chairs together with an elegant low table. These chairs with designer fabric are timeless, foldable and perfect to use for pre-dinner drinks. When the fine weather arrives, wanting to eat dinner in the open becomes irresistible. Even in a smaller space, you can set aside a dining area. The patio tables and chairs are suitable for any area. The small folding table with its pair of chairs is perfect on a small balcony. On a terrace that is big enough to accommodate a large table, you should still take measurements. It is recommended to keep 90cm of space behind chairs, as well as a walkway of 150cm for serving items. By way of example, for a group of four people, you should estimate a table measuring 140 x 80 cm, and therefore allow a surface area of at least 7 m2 to set it up. Exterior decoration has a huge influence on the look you want, from urban rooftop, to Spanish-style patio, without forgetting the zen garden terrace or bohemian look. On a hanging chair or couch, it is easy to play with colour by using different shades of cushions. To amplify the cocoon effect, a pouffe or floor cushion can serve as additional seating for guests. Decorative accessories, such as a glass hurricane or vintage wooden crate are very common trends. To breathe life into this outdoor space and have it change into a calming oasis, you can also plant up a wall, even on a low one. All you need to do is to attach several terra cotta pots at different heights. It is best to choose plants that require little water, such as cactus or aloe species. Pots of plants can be scattered around as you like to brighten up a city garden. To bring the space together, mix green plants, grasses and flowers, but keep those that attract insects, such as lavender, away from the dining table. Anticipate the plants’ growth: hydrangea, for example, is quick to grow big. To provide a little vegetable patch, you can grow tomatoes in pots and also grow aromatic herbs. 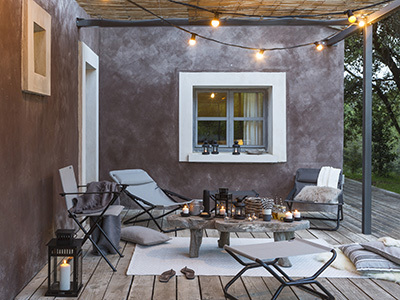 Finally, outdoor lighting remains an essential element for creating a cosy ambiance. While wall lights and lanterns offer a good light source, paper lanterns or string lights diffuse a muted, soft light.